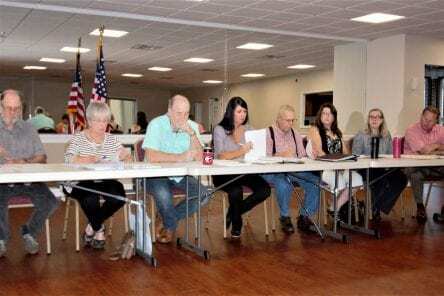 HIAWASSEE, Ga. – Towns County Conventions and Visitors Bureau held a regular Board session on the morning of Tuesday, Sept. 11, to discuss and approve several matters, including the decision to hold a contest for Young Harris College students to design the organization’s logo and sign. Graphic Art students will be provided an opportunity to express their talents, with a $100 prize as an incentive for the grand finalist. The deadline for entries is expected to fall in November, and the Board will chose the winning design during a year-end meeting. The Board agreed that Lake Chatuge and the mountains should be prominently featured on the logo. A Code of Ethics was unanimously adopted by Board members. The mission states a committment by Board members to observe and promote the highest standards of ethical conduct in the performance of responsibilities. Listed among the standard expectations is that members should be current on county taxes, both personal and organizational. Hotel-motel tax collection was discussed, with note of business owners who have fallen behind in submission of payment. The total beginning August balance from the Towns County Commissioner financial report amounted to $88,823. Expenditures for Bureau operations, the upcoming Bass Masters Tournament, computer software, and a lease for a copy machine reduced the ending balance to $13,469 at August’s end. Towns County Commissioner Cliff Bradshaw, who attended the Board meeting, relayed that his office is working with Georgia State Senator John Wilkinson, and Senator Steve Gooch to “put more teeth” into the collection of due hotel-motel taxes. Bradshaw stated that there are “too many loopholes and loose ends” in the current system. Board member Jane Holland was awarded the official title of Administrative Manager of Towns County Conventions and Visitors Bureau. Georgia Mountain Fair Manager Hilda Thompson, Hamilton Gardens Chair Grace Howard, and Towns County Civic Association President Michael Courney provided activity updates to the Board. Thompson announced an impressive attendance of 7100 at the recent 3-day Dailey and Vincent Landfest, with 400 tickets reserved for next year’s event. Howard divulged a year-to-date vehicle count of 3176 at Hamilton Gardens, with visitors estimated at double that amount. Courney encouraged the Board to become a member, as a whole, of the Civic Association. Commissioner Bradshaw extended appreciation for the hard work and dedication extended by the Towns County Conventions and Visitors Bureau, affirming that the Board has advanced seamlessly since its inception approximately 18 months prior. Furthermore, Bradshaw praised Thompson, Howard, and Courney for their service to the community. The Towns County Conventions and Visitors Bureau will hold a work session on Tuesday, Oct. 9, at 8:00 a.m. at the Towns County Civic Center to review grant proposals. Meetings are open to the public.